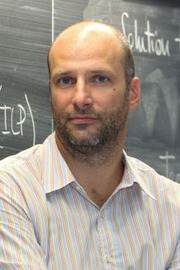 Bio: Dr. Andrea Lodi is a professor in the department of Mathematical and Industrial Engineering at the Polytechnique Montreal. He is the Canada Excellence Research Chair in Data Science for Real-Time Decision-Making at Polytechnique Montréal, Canada’s main chair in operations research. Before joining the Polytechnique, Lodi was a professor in operations research in the faculty of electrical and information engineering at Italy’s University of Bologna. He earned his doctorate in systems engineering from this same university in 2000. Lodi is interested in developing new models and algorithms that would make it possible to process a large quantity of data from multiple sources both rapidly and effectively. Through his research, he is looking for solutions designed to improve the electricity market, rail transport logistics, and health-care planning. Lodi’s innovative work has earned him several awards, including the Google Faculty Research Award in 2010 and the IBM Faculty Award in 2011. In 2005 and 2006, he was a fellow in the prestigious Herman Goldstine program at the IBM Thomas J. Watson Research Center in New York. In addition to co-ordinating several large-scale European projects in operations research, Lodi has also acted as a consultant for the IBM CPLEX research and development team since 2006. He has authored more than 70 publications in top mathematical programming journals; and has served as associate editor for several of these journals.